I learned several new tricks in the course of generating these forecasts and building this app, so the exercise served its didactic purpose. (You can find the code for the app here, on GitHub.) I also got lucky with the release of a new R package that solved a crucial problem I was having when I started to work on this project a couple of weeks ago. Open source software can be a wonderful thing. The forecasts posted right now are based on results of the pairwise wiki survey through the morning of Monday, August 17. At that point, the survey had already logged upwards of 12,000 votes, triple the number cast in last year’s edition. This time around, I posted a link to the survey on the r/nfl subreddit, and that post produced a brief torrent of activity from what I hope was a relatively well-informed crowd. The regular season doesn’t start until September, and I will update these forecasts at least once more before that happens. With so many votes already cast, though, the results will only change significantly if a) a large number of new votes are cast and b) those votes differ substantially from the ones already cast, and those conditions are highly unlikely to intersect. One thing these forecasts help to illustrate is how noisy a game professional football is. By noisy, I mean hard to predict with precision. Even in games where one team is much stronger than the other, we still see tremendous variance in the simulated net scores and the associated outcomes. Heavy underdogs will win big every once in a while, and games we’d consider close when watching can produce a wide range of net scores. Take, for example, the week 1 match-up between the Bears and Packers. Even though Chicago’s the home team, the simulation results (below) favor Green Bay by more than eight points. 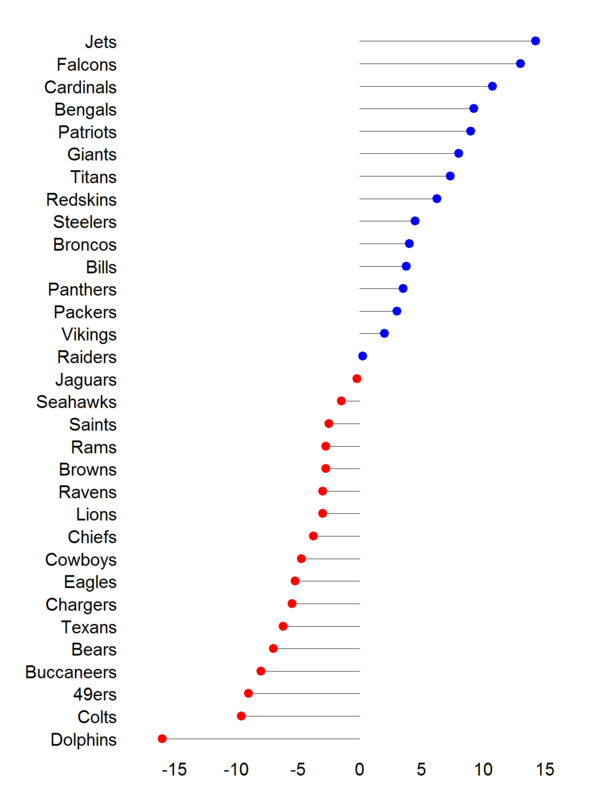 At the same time, those simulations also include a smattering of outcomes in which the Bears win by multiple touchdowns, and the peak of the distribution of simulations is pretty broad and flat. Some of that variance results from the many imperfections of the model and survey scores, but a lot of it is baked into the game, and plots of the predictive simulations nicely illustrate that noisiness. I’m now hoping to use this problem as an entry point to learning about Bayesian updating and how to program it in R. Instead of updating the actual survey scores, we could treat the preseason scores as priors and then use observed game scores or outcomes to sequentially update estimates of them. I haven’t figured out how to implement this idea yet, but I’m working on it and will report back if I do. * The pairwise wiki survey runs on open source software, and I can imagine modifying the instrument to give more weight to recent votes than older ones. Right now, I don’t have the programming skills to make those modifications, but I’m still hoping to find someone who might want to work with me, or just take it upon himself or herself, to do this. I like to ride bikes, I like to watch the pros race their bikes, and I make forecasts for a living, so I thought it would be fun to try to predict the outcome of this year’s Tour de France, which starts this Saturday and ends on July 26. I’m also interested in continuing to explore the predictive power of pairwise wiki surveys, a crowdsourcing tool that I’ve previously used to try to forecast mass-killing onsets, coup attempts, and pro football games, and that ESPN recently used to rank NBA draft prospects. 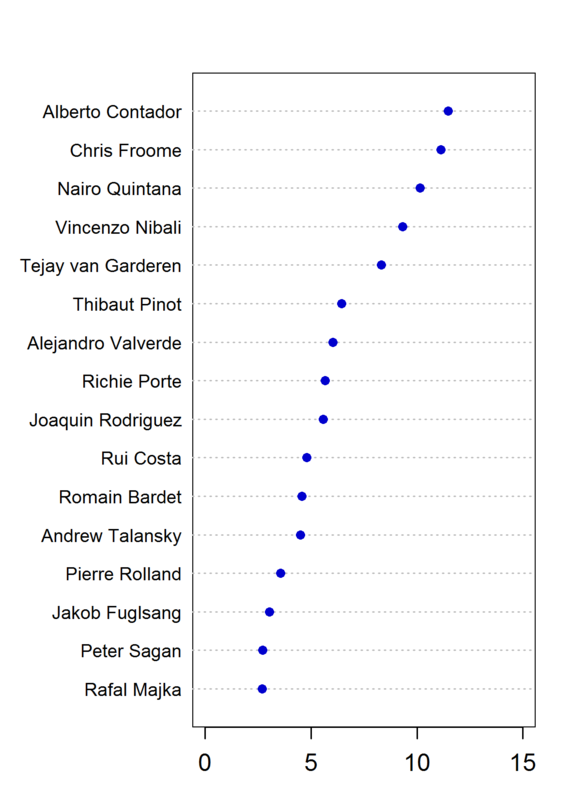 So, a couple of weeks ago, I used All Our Ideas to create a survey that asks, “Which rider is more likely to win the 2015 Tour de France?” I seeded the survey with the names of 11 riders—the 10 seen by bookmakers at Paddy Power as the most likely winners, plus Peter Sagan because he’s fun to watch—posted a link to the survey on Tumblr, and trolled for respondents on Twitter and Facebook. The survey got off to a slow start, but then someone posted a link to it in the r/cycling subreddit, and the votes came pouring in. 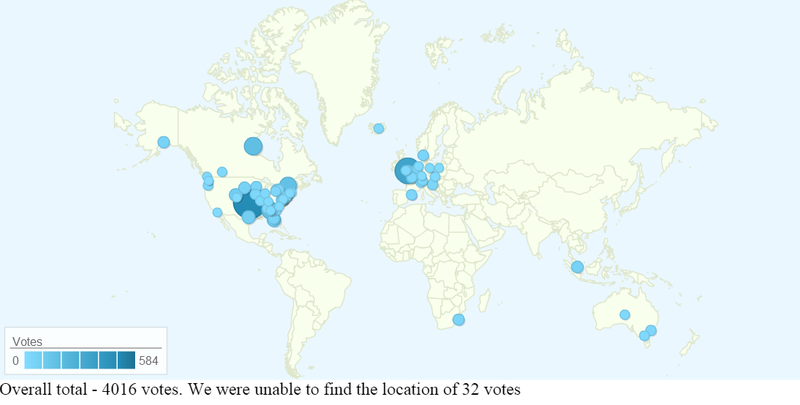 As of this afternoon, the survey had garnered more than 4,000 votes in 181 unique user sessions that came from five continents (see the map below). The crowd also added a handful of other riders to the set under consideration, bringing the list up to 16. So how does that self-selected crowd handicap the race? 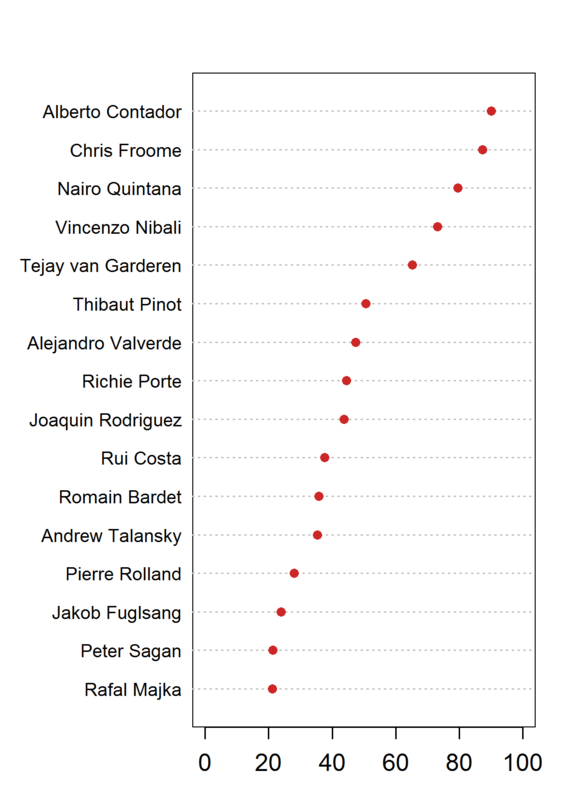 The dot plot below shows the riders in descending order by their survey scores, which range from 0 to 100 and indicate the probability that that rider would beat a randomly chosen other rider for a randomly chosen respondent. In contrast to Paddy Power, which currently shows Chris Froome as the clear favorite and gives Nairo Quintana a slight edge over Alberto Contador, this survey sees Contador as the most likely winner (survey score of 90), followed closely by Froome (87) and a little further by Quintana (80). Both sources put Vincenzo Nibali as fourth likeliest (73) and Tejay van Garderen (65) and Thibaut Pinot (51) in the next two spots, although Paddy Power has them in the opposite order. Below that, the distances between riders’ chances get smaller, but the wiki survey’s results still approximate the handicapping of the real-money markets pretty well. There are at least a couple of ways to try to squeeze some meaning out those scores. One is to read the chart as a predicted finishing order for the 16 riders listed. That’s useful for something like a bike race, where we—well, some of us, anyway—care not only who wins, but also where other will riders finish, too. We can also try to convert those scores to predicted probabilities of winning. The chart below shows what happens when we do that by dividing each rider’s score by the sum of all scores and then multiplying the result by 100. The probabilities this produces are all pretty low and more tightly bunched than seems reasonable, but I’m not sure how else to do this conversion. I tried squaring and cubing the scores; the results came closer to what the betting-market odds suggest are the “right” values, but I couldn’t think of a principled reason to do that, so I’m not showing those here. If you know a better way to get from those model scores to well-calibrated win probabilities, please let me know in the comments. So that’s what the survey says. After the Tour concludes in a few weeks, I’ll report back on how the survey’s predictions fared. Meanwhile, here’s wishing the athletes a crash–, injury–, and drug–free tour. Judging by the other big races I’ve seen so far this year, it should be a great one to watch. Posted in Forecasting, Methods, Misc. The second Annual Bank Conference on Africa happened in Berkeley, CA, earlier this week, and the World Bank’s Development Impact blog has an outstanding summary of the 50-odd papers presented there. If you have to pick between reading this post and that one, go there. One paper on that roster that caught my eye revisits the choice of statistical models for the study of civil wars. As authors John Paul Dunne and Nan Tian describe, the default choice is logistic regression, although probit gets a little playing time, too. They argue, however, that a zero-inflated Poisson (ZIP) model matches the data-generating process better than either of these traditional picks, and they show that this choice affects what we learn about the causes of civil conflict. Having worked on statistical models of civil conflict for nearly 20 years, I have some opinions on that model-choice issue, but those aren’t what I want to discuss right now. Instead, I want to wonder aloud why more researchers don’t use prediction as the yardstick—or at least one of the yardsticks—for adjudicating these model comparisons. In their paper, Dunne and Tian stake their claim about the superiority of ZIP to logit and probit on comparisons of Akaike information criteria (AIC) and Vuong tests. Okay, but if their goal is to see if ZIP fits the underlying data-generating process better than those other choices, what better way to find out than by comparing out-of-sample predictive power? Prediction is fundamental to the accumulation of scientific knowledge. The better we understand why and how something happens, the more accurate our predictions of it should be. When we estimate models from observational data and only look at how well our models fit the data from which they were estimated, we learn some things about the structure of that data set, but we don’t learn how well those things generalize to other relevant data sets. 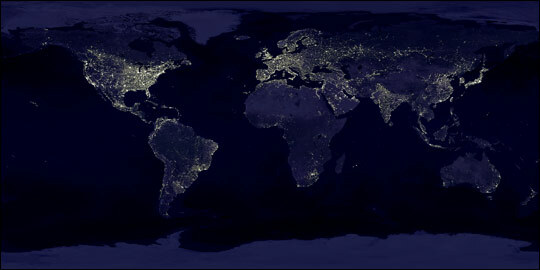 If we believe that the world isn’t deterministic—that the observed data are just one of many possible realizations of the world—then we need to care about that ability to generalize, because that generalization and the discovery of its current limits is the heart of the scientific enterprise. From a scientific standpoint, the ideal world would be one in which we could estimate models representing rival theories, then compare the accuracy of the predictions they generate across a large number of relevant “trials” as they unfold in real time. That’s difficult for scholars studying big but rare events like civil wars and wars between states; though; a lot of time has to pass before we’ll see enough new examples to make a statistically powerful comparison across models. But, hey, there’s an app for that—cross-validation! Instead of using all the data in the initial estimation, hold some out to use as a test set for the models we get from the rest. Better yet, split the data into several equally-sized folds and then iterate the training and testing across all possible groupings of them (k-fold cross-validation). Even better, repeat that process a bunch of times and compare distributions of the resulting statistics. Prediction is the gold standard in most scientific fields, and cross-validation is standard practice in many areas of applied forecasting, because they are more informative than in-sample tests. For some reason, political science still mostly eschews both. * Here’s hoping that changes soon. * For some recent exceptions to this rule on topics in world politics, see Ward, Greenhill, and Bakke and Blair, Blattman, and Hartman on predicting civil conflict; Chadefaux on warning signs of interstate war; Hill and Jones on state repression; and Chenoweth and me on the onset of nonviolent campaigns.